Phoenix Irregular Guard will be having a shoot at the Goddard Territorial Justice Committee, LLC range at Colfax, Iowa this Sunday, July 19th. 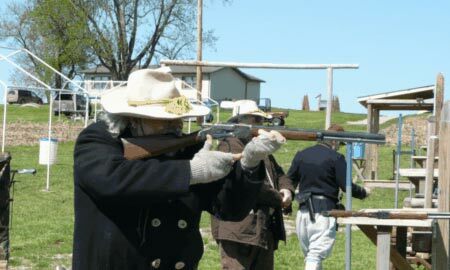 The shooters meeting is at 9:30 a.m. with the fun starting shortly after. This match will be held in a GAF format as a warm up for the Iowa Muster in September. This is a great bunch of folks trying very hard to make a new club grow. I hope you will please consider making the trip to Colfax this Sunday for this match. It’s going to be a whole bunch of fun!! Military uniforms are appreciated but not required and it’s a great opportunity to explore the GAF shooting style. If you have guns appropriate for any NCOWS match, you have what you need for the GAF match. For more information about the Phoenix Irregular Guard, please click here.